I apologize that I embargoed my Wednesday post until Thursday. But holidays trump blog schedules and I highly doubt any of you were waiting at your computers for that recipe to come through. Plus, our last baby season baby was born this week. Hooray! I shared Ella’s shower in the baby season post in case you want to check it out. She’s beautiful, healthy and came just in time for Valentine’s Day! If you didn’t already assume by this whole blogging thing, I’m a communicator. I like to talk. Let’s get serious, silence makes me uncomfortable. I believe in the power of the spoken written word. And because I like to engage in social conversation, every year leading up to Valentine’s Day I bribe my co-workers fill my candy jar with a supply of Sweet Tart Hearts with the hope that sweets will lead to a friendly hello, a restaurant suggestion or even just a brief life-update. And I make sure they are the Sweet Tart versions because I think we all know those chalky ones won’t do the job. My candy dish is out of sight this year and after low traffic in the first week, I decided to move it into the open space to let go of the inventory. So for the remainder of the holiday lead-up, I was left to merely yell hello across the wall as I heard the ting of the lid each time someone dug in. And you’re kidding yourself if you think that ‘someone’ would announce who they were. Pshh. They were off just as soon as that powdery sugar substance hit their veins. 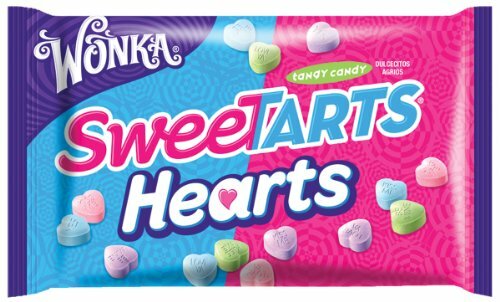 One thing I did learn is that people love them some sweet tart hearts. 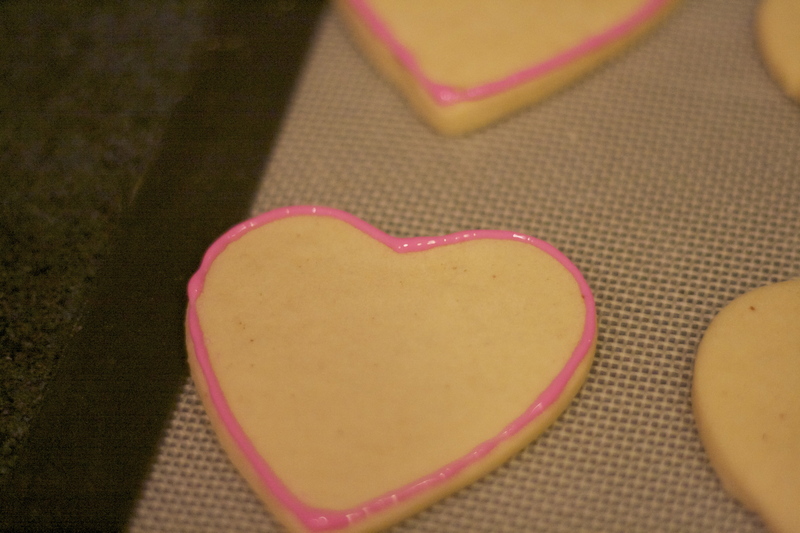 So while contemplating ideas for what kind of treat to bring in the office on Valentine’s Day, I decided to stick with the theme and whip up a batch of conversation heart sugar cookies. Can I have a moment for a brief aside on what I am calling the ‘flash’ flood of February holidays this year? (there’s a bead reference there in case you missed it) Anyone else think it’s kind of cuckoo that Mardi Gras and Valentine’s Day are happening in the same week? Talk about holiday treat idea overload! So back to those cookies. You may have seen a sneak peek of these cookies in my earlier post about finding balance. 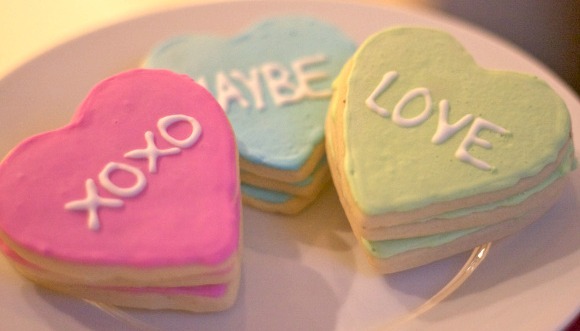 Well after gearing up to make these cookies late Sunday night in time for Valentine’s Week, I decided take my own advice and postpone the decorating until the actual day. 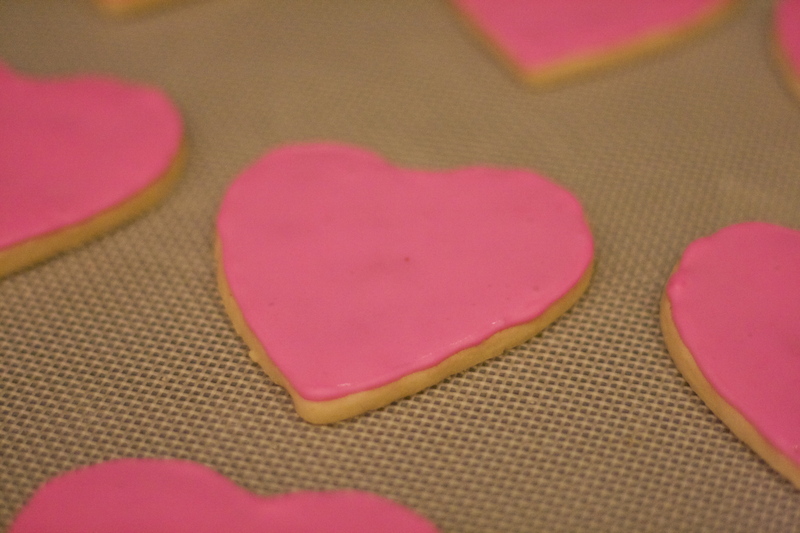 Fortunately both the cookie recipe and royal icing keep very well for up to a week. I tried a new recipe this time around and while the jury is still out for taste, they seemed to cook to the proper consistency and shape I wanted. Typically I do a yogurt or sour cream and traditional sugar dough but the powdered sugar in these makes them puff up nicely. 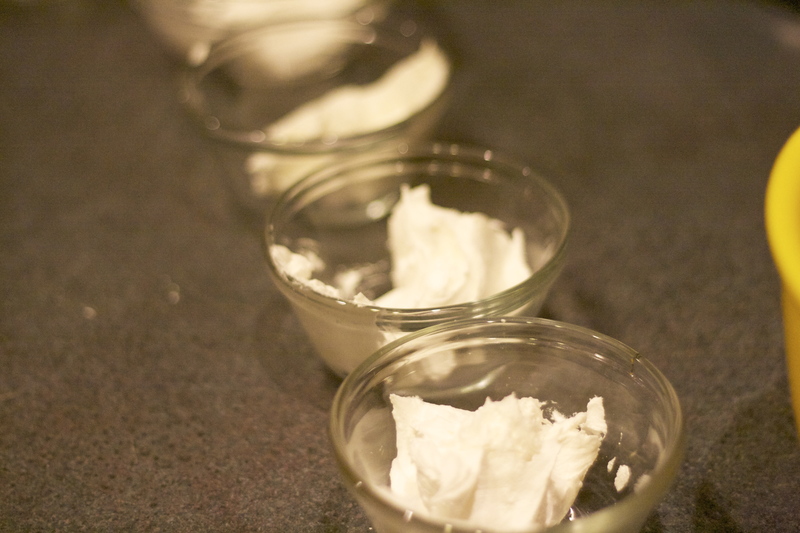 Cream butter in mixer on medium speed. Add powdered sugar. Mix in egg, almond and vanilla. Roll dough to desired thickness. 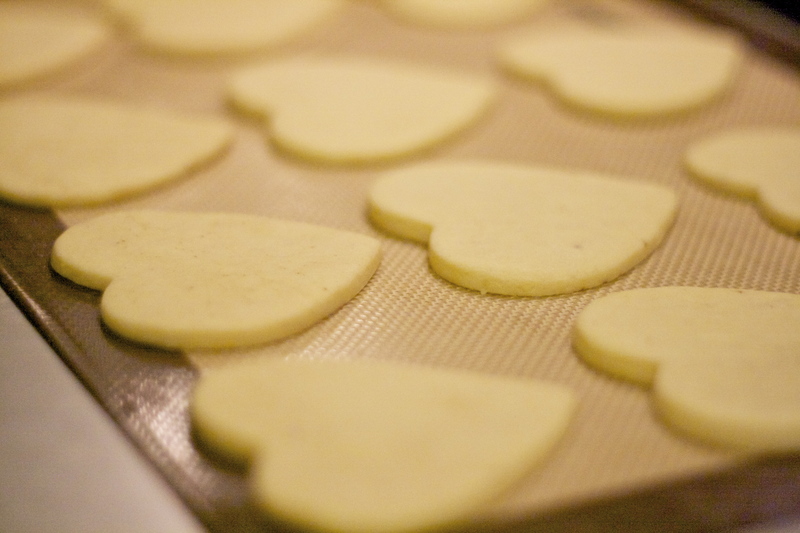 Cut out cookies with floured cookie cutter and place on baking mat. Bake at 375 for 8-10 minutes. 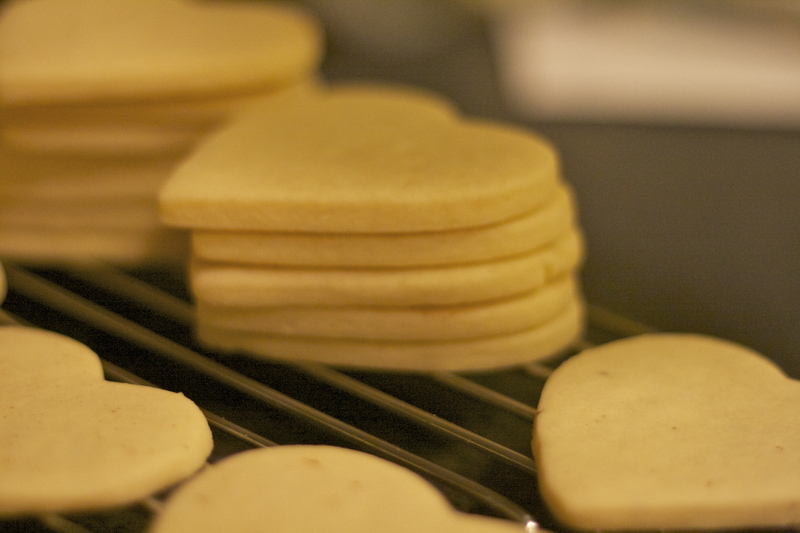 Cookies will not turn golden but should move from the pan when touched. Cool for 2 minutes on pan and then transfer to cookie rack. Want to try the original? Recipe adapted from Annie’s Eats. 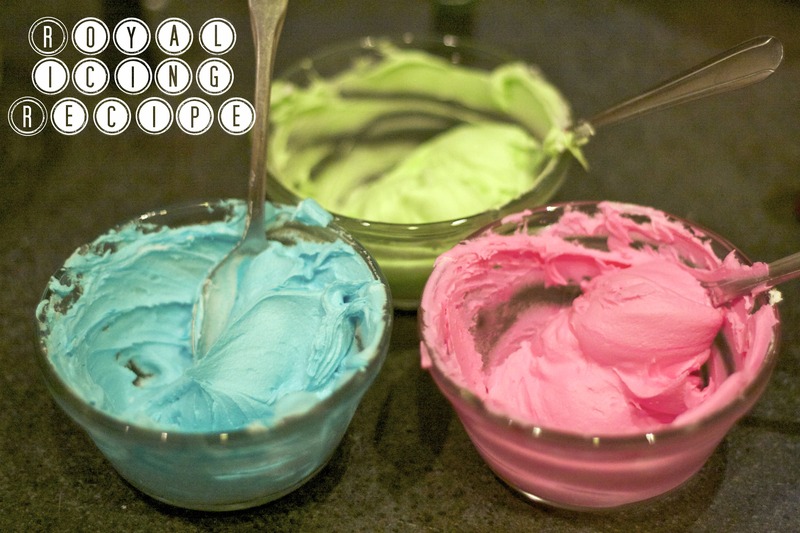 Divide into bowls and add gel coloring (gel works better as food coloring is water-based and can thin out icing). Add water and stir until icing pours smoothly but isn’t runny. This is the best icing for outlining (piping). Pipe outlines around hearts and let stand until dry. 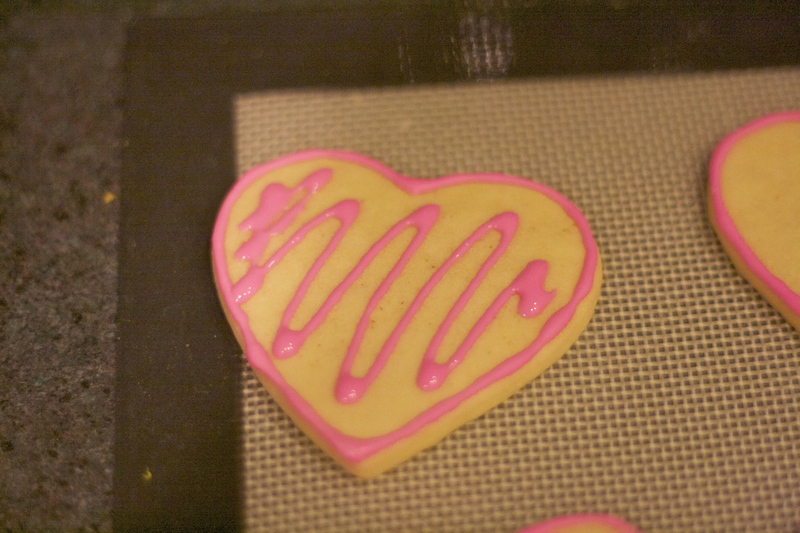 Add more water to icing to create fill and then ice as if you are coloring in a picture. Let base layer completely dry before piping on the letters. I wasn’t patient enough with mine (story of my life) so they are a little messy. 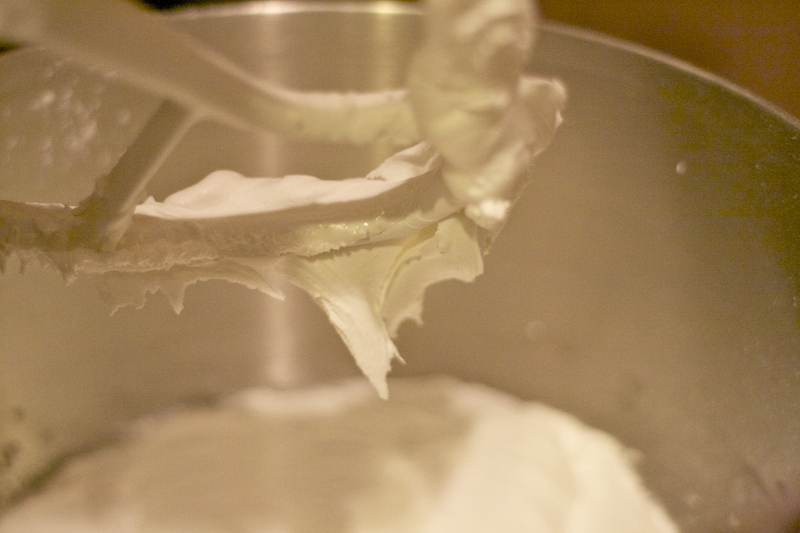 Don’t be afraid to add more powdered sugar or water to get your icing to the desired consistency. And don’t be afraid to have fun with the messages. I kept it pretty PC this year although the later it got in the night the more I felt the urge to write blasphemous things. Ah, Valentine’s Day. Initiating awkwardness every February. 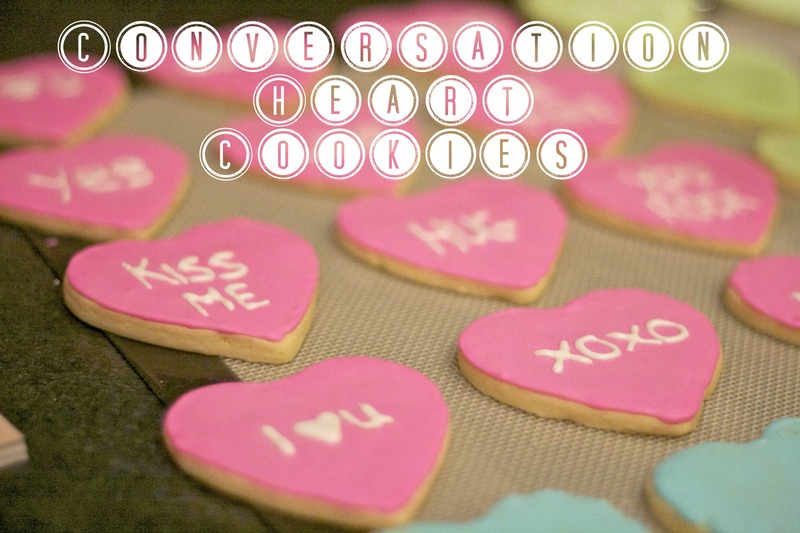 What is your favorite childhood memory of Valentine’s Day? Mine was circa 1993 when I got a box of chocolates, a gold necklace and $25 from 3 separate boys in my class (it was a small school.) I can still see the look on my mother’s face when I burst through the door and I told her that one boy gave me $25! I mean chocolates and jewelry are nice and all but $25 Mom. Isn’t that awesome! My excitement was quickly doused as I was instructed to return to school the next day, thank the young boy for his contribution towards my life savings but inform him that I could not accept cash gifts. Hmmm, maybe I should have just brought cash into the office today.